When waste water from the kitchen moves through the grease trap, the grease and oils rise to the surface and are trapped inside the receptacle using a system of baffles. 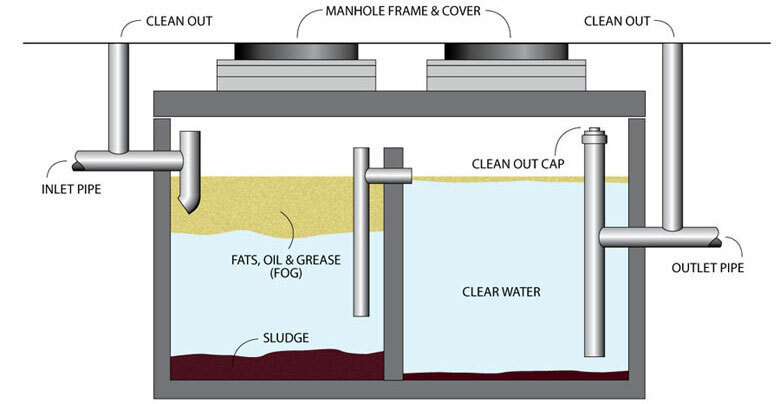 The trapped or captured grease and oils fill the trap from the top down, allowing the clean water at the bottom of the trap to flow into the sanitary sewer line. This explains why you see a layer of grease at the top of the grease trap. As this layer accumulates, the trap needs to be cleaned out. Cleanout. Cleanouts give you a chance to rod or jet the lines if there is a backup. Outlet Fitting and Cap. This component should be about 18 inches from the base of the trap, allowing only water to flow out to the sanitary sewer. Manhole Covers. These should be solid steel, never cement. Baffle Walls. One of the most important features in terms of separating the material in the grease trap. Their key function is to keep everything from getting to the outlet side.